Gordon Burstein needs a job, but he really has no qualifications for much of anything. He dropped out of college, and has been fired by every landscaping company in Santa Fe where he’d come to escape from his parents and New Jersey. 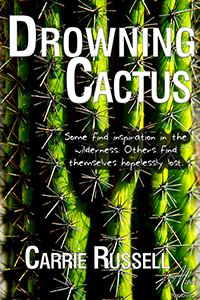 He manages to land a job with Rosa, an eccentric artist, but she needs cacti, preferably large, to dissect for her work. Gordon ends up stealing saguaros from Organ Pipe, and after a number of these thefts, he is caught. Rosa doesn’t want him to mention her, because her art has just become very popular, but she does give him a large check as his part of her newly earned commissions. Carrie Russell has written an introspective novel as the two main characters, Gordon and Mora, search for meaning in their lives. Mora founded a non-profit organization SPROUTS which has just been taken over by those who want it to become highly profitable, firing her in the process. Both Gordon and Mora struggle to find their identities, and both characters are fully developed and very believable. I liked them and really felt for their dilemmas. The story is told from alternating perspectives, Gordon in the Southwest and Mora in Massachusetts. Before long, thanks to Gordon’s notoriety as some sort of eco-protestor as well as his community service hours at a nursery, the two discover each other. Mora needs advice about setting up a cactus garden for the local students and Gordon becomes her source of information. Obviously, developing a cactus garden in Massachusetts is an enormous project, something which Gordon ends up doing mostly on his own, using the monies from his job with Rosa. This story also has interesting minor characters who interact with Gordon and Mora, and the minor characters definitely add depth to the story and help define both Gordon and Mora better. Each of us has no doubt wondered from time to time what our purpose in life is and what we are supposed to be doing. Gordon comes up with some very simple, but extremely powerful answers and it is up to Mora to see if she can find her own peace. This is a gentle, fun novel which gives the reader not only a good story, but a lot to think about. As Gordon wonders early in the novel, “Did he need healing, too? He didn’t have any nameable aliment but he felt some important part of his inside was hollow. Maybe it was the lack of purpose Rosa had hit on. Maybe he just wasn’t meant to amount to much and his expectations, instead of his aspirations, needed adjusting.” Well, it turns out that there is nothing wrong with Gordon’s expectations or his aspirations, and I enjoyed following his adventures as he discovers his purpose in life and just where he is meant to be, at least at this moment in time.